Given the choice of the numerous film depictions of Monroe's life, this is the one to watch. Lifetime recently celebrated 25 years of its brand of cheaply made, “based on a true story” TV movies with a heavily hyped, star-studded parody A Deadly Adoption. 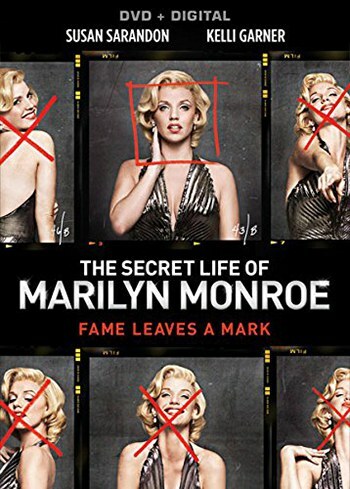 The cable network showed a better sign of growth earlier this year, when it aired The Secret Life of Marilyn Monroe, a two-part biopic based on the highly-regarded book of the same name. Despite its salacious title, the resulting three-hour movie mostly revolves around the legendary actress' relationship with her paranoid schizophrenic mother and her resulting psychological problems. The girl who would be Marilyn, Norma Jeane Mortenson, is introduced as a blonde-haired toddler living with her prickly “Aunt Ida” (Gloria Gruber) on a farm. But this normalcy is interrupted by the out-of-control whirlwind that is Norma's biological mother, Gladys. First (and perhaps best) played by Eva Amurri Martino, she accuses her friend of kidnapping her child, rants about the nondescript people who are out to get her, and snatches Norma into a fabric bag before being reminded that she has been paying Ida five dollars a week to take care of the child. Gladys is not evil or stupid, she just suffers from the same mental illness that likely led to her mother's death in an insane asylum. Throughout the movie, she veers from extreme paranoia to a shell dulled by shock treatment, but in a few moments of lucidity (Susan Sarandon's best out of the material she's given), she shows genuine care for her daughter. Norma finds herself in the care of her mother's well-meaning yet weak-minded friend, Grace (Emily Watson). Grace is forced to send Norma to an orphanage for a while, but often visits to cheer up the sad, quiet child with celebrity magazines, visits to the movie theater, and dreams of big-screen stardom. Not unlike many other girls her age, Norma eventually grows into a teenager obsessed with the idea of becoming a star. Kelli Garner takes over the role of 15-year-old Norma Jeane as a giggly, pig-tailed brunette practicing her signature voice/mannerisms in a mirror. It works, because just as Garner is an actress pretending to be someone she obviously isn't, Norma is pretending to be her ideal of a big-screen star. Grace, now with an ever-present drink in her hand, ends Norma's childhood in a single conversation, as she urges her to get married because Grace's new husband “thinks she's too...”. We don't have to hear the end of that statement. It's already obvious what the vast majority of male society wants from the shapely young woman, and her first husband (portrayed as an easily frustrated cad) threatens her lack of sexual interest with a visit to the same mental hospital that holds her mother. Still, Norma is presented as a kind, cheerful, exceptionally likable woman stuck in a cruel world. She humbly doubts if a photographer at the munitions plant she's working at would want to use her as a model for Stars and Stripes, and thanks every sleazy guy who hires her for whatever minor-league modeling job she happens to get. When her mother visits and rips up her prized magazine covers in a fit of misguided religious zeal, Norma's only reaction is to pick up the pieces and bemusedly sigh, “My, what a mess we've made!” A natural talent, who isn't afraid to ask questions, take advice, or learn all she can about the technicalities of lighting and make-up, she eventually gets a contract with a major movie studio. Following this, the film shows Marilyn becoming opportunistic in the worst sense, as she climbs her way to the top by lying on her back. Still, as she's passed around like a baseball card among aging studio big-wigs, Marilyn is portrayed as ridiculously naïve and kind to the point where one wonders if she actually has feelings for these disgusting men. With the exception of her loyal make-up artist, Whitey (Matthew Bennett), every male character in the movie eventually insults her, degrades her, or just looks at her like a piece of meat. Of course, Marilyn, after her platinum blonde Hollywood makeover, takes all of this attention as a complement, making purring passes at every man she sees. It's safe to say that Garner is a dead-on ringer for Norma Jeane Mortenson, but she doesn't manage to transition to resembling Marilyn Monroe. In the few scenes that actually depict moments in her career, such as when she rehearses “Diamonds Are a Girl's Best Friend” or the sidewalk scene in The Seven Year Itch, it becomes painfully apparent that you are not watching the original. Yet surprisingly, in the more candid moments of Monroe's life, Garner nails it. The vast majority of the story takes place in flashback, as Marilyn introduces herself and opens up to her new therapist, Dr. DeShields (Jack Noseworthy). Noseworthy also offers a good performance, as he shifts from lust, shock, pity, and eventually relief throughout learning Monroe's story. As the second half of the film unfolds, that story grows darker. Overworked by the studio and under pressure to be “a real actress” by her Method-teaching acting coach, Marilyn turns to alcohol and unidentified pills and succumbs to bursts of her inherited mental illness. The only one who seems concerned with her well-being is her new husband, Joe DiMaggio (Jeffrey Dean Morgan). DiMaggio is presented as an ordinary man thrust into the world of celebrity, longing for a normal family life with the woman who enchants him. He's the only character who will tell Marilyn that she needs rest and doesn't need any pills, so it's confusing to see him slap her in the face and beat her in a jealous rage later on. (He's shown holding a drink during these scenes, so it could be interpreted that these were uncharacteristic, alcohol-fueled rages.) Marilyn stands strong and files for divorce, but ends up in a relationship with the psychologically abusive Arthur Miller (Stephen Bogaert), who treats her like a trophy while he incessantly clacks away at the script for The Misfits. Marilyn, seemingly inheriting a lesser form of her mother's mental illness, occasionally hears voices, but has a full-on psychotic episode after the miscarriage of her baby with Miller. As her mother did years before, she accuses nondescript people and then a former employee of stealing the baby from her, before Arthur chides her for “murdering” their child with “booze and pills”. A newly divorced Marilyn then obsesses over John. F. Kennedy after a weekend fling (wisely not shown on screen), and accuses others of tapping her phone, having her followed, and sending poison-pen letters under her mother's name. In perhaps the most chilling scene in the movie, Marilyn is placed in a straight jacket and involuntarily committed to a padded cell in a mental institution. Joe DiMaggio, leading a team of Marilyn's friends and loved ones, gets her released, and Marilyn seems to be on the road to recovery. This is where The Secret Life of Marilyn Monroe leaves the actress: hopeful. She's hopeful about the future of her career, a possible reconciliation with DiMaggio, and her vow to switch her psychiatric care to the capable Dr. DeShields. When she goes to bed, it's strange to see her drift off to sleep, knowing that she won't wake up again. A mere freeze frame and dream sequence tells us all we need to know. Yes, it's sad that Marilyn Monroe died so young, but it's a downright shame that Norma Jeane Mortenson is gone forever. Given the choice of the numerous film depictions of Monroe's life, this is the one to watch. With its high production values, talented cast, and a script that is as factual as possible, even Monroe's most ardent fans have nothing to complain about. The only regret is that this particular DVD release is completely devoid of any bonus features. Considering that the movie is up for three Creative Arts Emmys for its cinematography, make-up, and hair-styling, one would think some behind-the-scenes featurettes about these processes would be included.